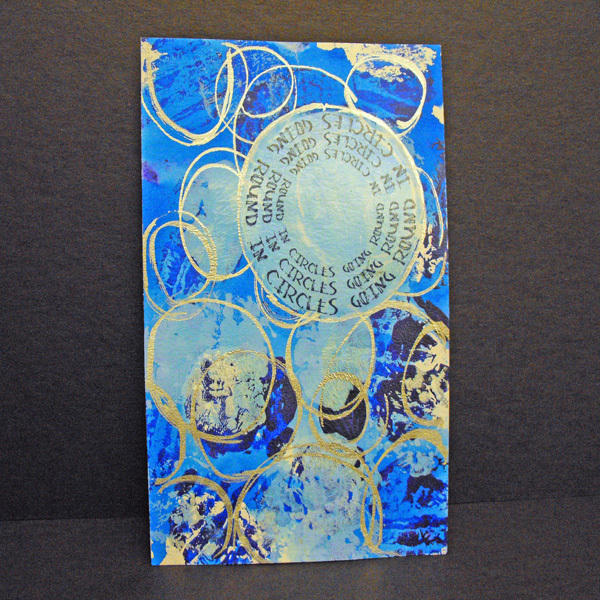 Project Description: Create a layered art journal page using Grafix Impress Monoprinting Plates and Rub-Onz. Die cut circles from corrugated card, paint roughly with cyan and purple paints and print onto a Grafix Impress Monoprinting Plate. Pick up an impression with a piece of mixed media paper cut to the size of your journal. The big advantage of using the printing plate here is that you don’t get thick smeary paint, which you might well if printing direct to paper with the die cuts. Clean the printing plate. Use a pipette to drop Ecoline Ultramarine ink onto the printing plate. Smoosh the ink around with a brayer. Press the journal page into the ink to add another layer of printing. Dry well. Use the corrugated circles again, this time to print onto the Monoprinting Plate with white paint. Take a print. Because the Ecoline ink is water reactive, the circles will come out a soft, pale blue. Create a rub-on (don’t forget to flip the image before printing). Position the rub-on without sticking – draw around it lightly. Paint a large circle to fit it in white paint and dry well. Add the rub-on to the page following the manufacturer’s instructions, overlaying the large white circle. Outline with Sakura calligraphy pen in silver. Continue to outline with circles with silver pen, creating some scribbly lines to add interest.